Gould, R., Parker Harris, S., Caldwell, K., Fujiura, G., Jones, R., Ojok, P. & Perez, K. (2015). Beyond the Law: A Review of Knowledge, Attitudes and Perceptions in ADA Employment Research. Disability Studies Quarterly, 35(3). Renko, M., Parker Harris, S., & Caldwell, K. (2015). Entrepreneurial Entry by People with Disabilities. International Small Business Journal. Parker Harris, S., Renko, M., & Caldwell, K. (2014). Social Entrepreneurship as an Innovative Pathway to Employment for People with Disabilities: Exploring Political-Economic and Socio-Cultural Factors. Disability & Society, 29(8), 1275-1290. ​Caldwell, K. (2014). Dyadic Interviewing: A Technique Valuing Interdependence in Interviews with Individuals with Intellectual Disabilities. Qualitative Research, 14(4), 488-507. Parker Harris, S., Owen, R., Jones, R., & Caldwell, K. (2013). Does Workfare Policy in the United States Promote the Rights of People with Disabilities? Vocational Rehabilitation, 39(1), 61-73. Parker Harris, S., Renko, M., & Caldwell, K. (2013). Accessing Social Entrepreneurship: Perspectives of People with Disabilities and Key Stakeholders. Vocational Rehabilitation, 38(1), 35-48. Caldwell, K., Parker Harris, S., & Renko, M. (2012). The Potential of Social Entrepreneurship: Conceptual Tools for Applying Theory to Policy and Practice. Intellectual and Developmental Disabilities, 50(6), 505-518. Caldwell, K. (2010). We Exist: Intersectional In/Visibility in Bisexuality & Disability. Disability Studies Quarterly, 30(3/4). Caldwell, K. (2018) Customized Employment. In: Heller, Parker Harris, Gill, and Gould (Eds.) Disability in American Life: An Encyclopedia of Policies, Concepts, and Controversies. Santa Barbara, CA: ABC-CLIO. Caldwell, K. (2018) Medical Paternalism. In: Heller, Parker Harris, Gill, and Gould (Eds.) Disability in American Life: An Encyclopedia of Policies, Concepts, and Controversies. Santa Barbara, CA: ABC-CLIO. Caldwell, K. (2018) Supported Employment. In: Heller, Parker Harris, Gill, and Gould (Eds.) Disability in American Life: An Encyclopedia of Policies, Concepts, and Controversies. Santa Barbara, CA: ABC-CLIO. Caldwell, K., Parker Harris, S., & Renko, M. (2017). Women, Disability and Entrepreneurship. In C. Henry, T. Nelson, & K. V. Lewis (Eds. ), The Routledge Companion to Global Female Entrepreneurship: Routledge. Caldwell, K., Parker Harris, S., & Renko, M. (2017) Understanding Disability, Entrepreneurship & Employment First Policy. This presentation was hosted by the Illinois Employment First Community of Practice. Caldwell, K., Parker Harris, S., & Renko, M. (2017). Understanding Disability & Entrepreneurship. This presentation was hosted by the Great Lakes ADA Center ADA Audio Conference Series. Kramer, J., Heller, T., & Caldwell, K. (2014). Illustrating Inclusive Interview Methodology in Research. This presentation was hosted by the AAIDD Research Division. Work Matters: A Framework for States on Workforce Development for People with Disabilities (2016). The Council of State Governments & National Conference of State Legislatures. Caldwell, K. (2016). The CEED Project: The Potential of Entrepreneurship. Disability.gov guest blogger. Caldwell, K. & Friedman, C. (2015). Plain Language Summaries for Publications. Association of University Centers on Disabilities (AUCD) best practice recommendation. Friedman, C. & Caldwell, K. (2015). Plain Language Summaries for Publications. AUCD Early Career Professionals' September guest blogger. Heller, T., van Heumen, L., Caldwell, K., Wei, Y., Xiong, S., Burke, M. (2015). Ligas Evaluation Annual Report: Year 2 Report. UIC Institute on Disability & Human Development, Annual Report. van Heumen, L., Caldwell, K., Xiong, S. & Heller, T. (2015). The Ligas Consent Decree: An Evaluation of the Preferences and Experiences of Persons with_ Disabilities on the Waiting List. UIC Institute on Disability & Human Development, Research Brief. Parker Harris, S., Gould, R., Caldwell, K., Fujiura, G. T., Jones, R., Ojok, P., Perez, K., & Olmstead, A. (2014). Rapid Evidence Review Technical Report (pp. 1-44). Chicago, IL: ADA National Network Knowledge Translation Center. Caldwell, K. (2014) Writing for Publication (As a Grad Student). 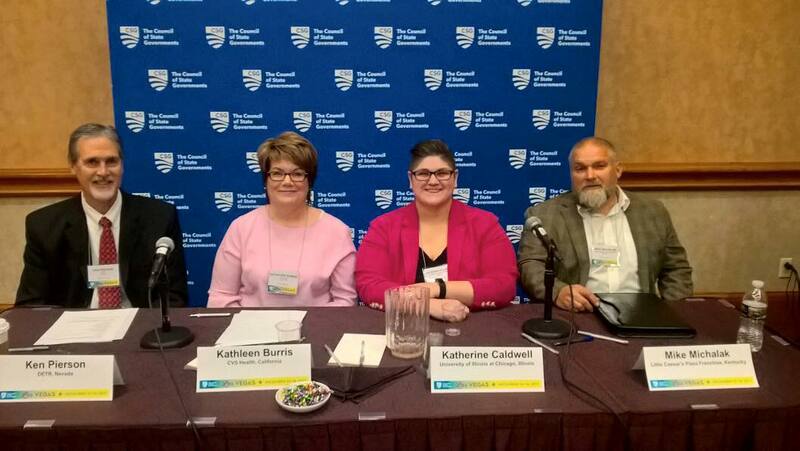 AUCD Early Career Professionals' June guest blogger. 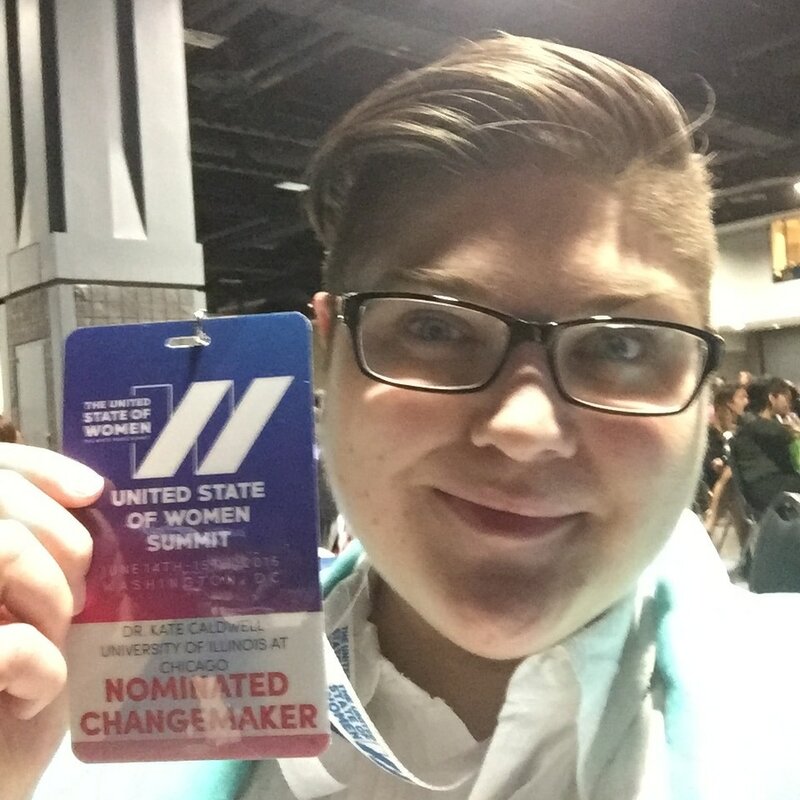 A Nominated Changemaker at the The White House Summit on the United State of Women (2016). 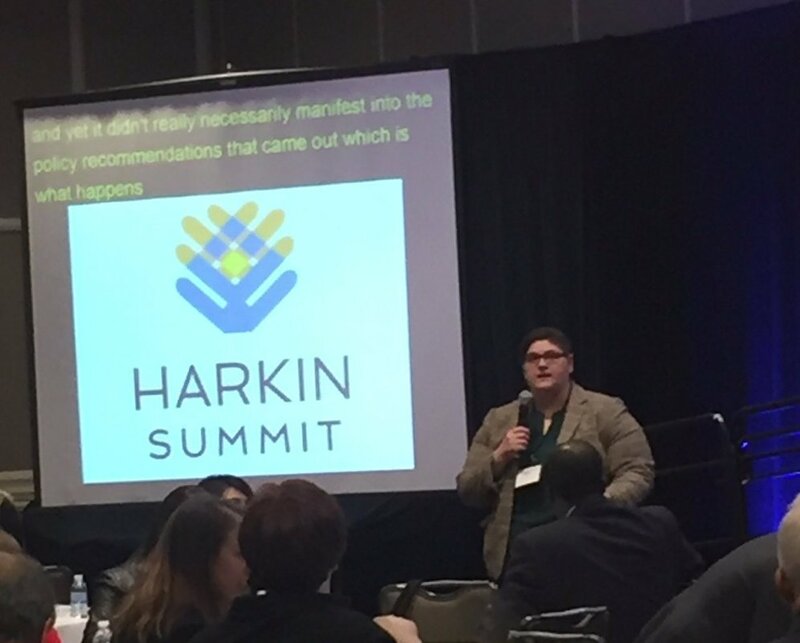 Asking a question about disability & entrepreneurship at the Harkin Summit, 2016. 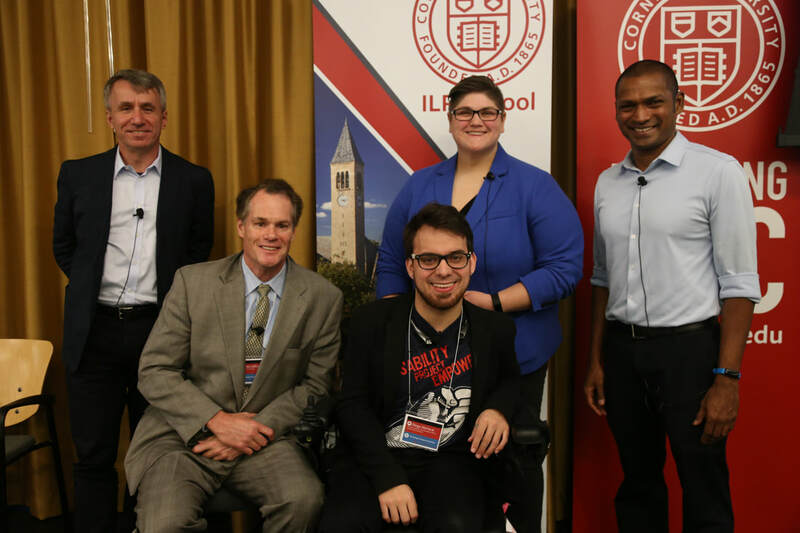 Speaking on a panel at the Yang-Tan Institute on Employment and Disability, ILR School at Cornell University, Inclusive Technology Conference, 2017. Speaking on a panel at the Council of State Governments Conference Policy Academy for Hiring & Retaining Workers with Disabilities, 2017. Women@Forbes: Women With Disabilities Face High Barriers To Entrepreneurship. How To Change That. By Samantha Harrington, January 31, 2018. Forbes: Accenture, EY, Google, Microsoft And Other Leaders Find Great Value In Employees With Disabilities. By Paolo Gaudiano, November 6, 2017. Council of State Governments Policy Brief: Workforce Development Efforts for People with Disabilities: Entrepreneurship, Tax Incentives and Procurement. By Elizabeth Whitehouse & Leah Byers, March 6, 2017. UIC News: East Meets West: Helping entrepreneurs who have disabilities make dreams a reality. By Francisca Corona, September 27, 2016. IDHD Annual Report: The CEED Project Reduces Employment Barriers Faced by People with Disabilities. September 27, 2016, pg. 11. JJ's List Blog: People with Disabilities are Often the Best Entrepreneurs! By JJ Hanley, July 31, 2015. Entrepreneur.com: This Program Wants to Help People With Disabilities Become Entrepreneurs. By Carly Okyle, May 27, 2015. ChicagoInno: New UIC Program Is Helping Disabled Entrepreneurs Start Up Their Businesses. By Jim Dallke, April 21, 2015. Disability Scoop: Program Looks To Turn People With Disabilities Into Entrepreneurs. By Michelle Diament, April 21, 2015. UIC News: Bringing business opportunities to disabled aspiring entrepreneurs. By Jeanne Galatzer-Levy, April 9, 2015. U. Chicago News: NoBody's Perfect documentary screening, panel discussion to tackle art, disability, sexuality. By Megan E. Doherty, May 21, 2013. UIC News: Helping people with disabilities become social entrepreneurs. By Jeffron Boynés, November 2, 2011.